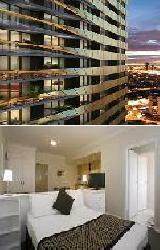 The Apartments Melbourne Domain South Melbourne provides guests with well appointed 1 & 2 bedroom self contained serviced apartments, ideally located in Albert Road, South Melbourne, close to the Melbourne CBD. Ideal for business and leisure travellers alike, the Apartments Melbourne Domain South Melbourne are set among the leafy splendour of the Domain precinct, Melbourne's most tightly held inner urban enclave. The Apartments Melbourne Domain are only a short walk to South Yarra, the Royal Botanic Gardens, Albert Park, Port Phillip Bay and a 10 minute drive to the Melbourne CBD, the iconic Melbourne Cricket Ground and the Crown Entertainment Complex. The 1 Bedroom Apartment is a luxury, modern, spacious, comfortable and non smoking apartment, ideal for a single, couple or corporate traveller. Offering high security with apartment swipe cards and video intercom security, the apartment is fully furnished, featuring a versatile, contemporary design with high quality fixtures and designer fittings, air conditioning and heating, a seperate spacious bedroom with 1 comfortable Queen Bed, vast built in robe, alarm clock, radio, immaculate and luxurious private en suite bathroom with shower, toilet, hair dryer and FREE bathroom amenities, a spacious seperate lounge dining room with lounge suite, dining table and chairs, flat-screen TV, DVD player, WIFI, direct dialling telephone, FREE cable TV, iPod docking station, a fully equipped kitchen with modern European appliances including refrigerator, microwave, dishwasher, oven, stove top, toaster, electric kettle, kitchenware, superbly engineered timber veneer kitchen joinery and reconstituted stone kitchen bench tops, full private laundry facilities with washing machine, clothes dryer, ironing facilities and a private generous furnished balcony with views. All towels and linen are included. The 2 Bedroom 2 Bathroom Apartment is a luxury, modern, spacious, comfortable and non smoking apartment, ideal for a family, 2 couples or corporate travellers. Offering high security with apartment swipe cards and video intercom security, the apartment is fully furnished, featuring a versatile, contemporary design with high quality fixtures and designer fittings, air conditioning and heating, 2 seperate spacious bedrooms each with 1 comfortable Queen Bed, vast built in robes, alarm clock, radio, 2 immaculate and luxurious private bathrooms with shower, toilet, hair dryer and FREE bathroom amenities, a spacious seperate lounge dining room with lounge suite, dining table and chairs, flat-screen TV, DVD player, WIFI, direct dialling telephone, FREE cable TV, iPod docking station, a fully equipped kitchen with modern European appliances including refrigerator, microwave, dishwasher, oven, stove top, toaster, electric kettle, kitchenware, superbly engineered timber veneer kitchen joinery and reconstituted stone kitchen bench tops, full private laundry facilities with washing machine, clothes dryer, ironing facilities and a private generous furnished balcony with views. All towels and linen are included. The 2 Bedroom Apartment is a luxury, modern, spacious, comfortable and non smoking apartment, ideal for a family, 2 couples or corporate travellers. Offering high security with apartment swipe cards and video intercom security, the apartment is fully furnished, featuring a versatile, contemporary design with high quality fixtures and designer fittings, air conditioning and heating, 2 seperate spacious bedrooms each with 1 comfortable Queen Bed, vast built in robes, alarm clock, radio, immaculate and luxurious private bathroom with shower, toilet, hair dryer and FREE bathroom amenities, a spacious seperate lounge dining room with lounge suite, dining table and chairs, flat-screen TV, DVD player, WIFI, direct dialling telephone, FREE cable TV, iPod docking station, a fully equipped kitchen with modern European appliances including refrigerator, microwave, dishwasher, oven, stove top, toaster, electric kettle, kitchenware, superbly engineered timber veneer kitchen joinery and reconstituted stone kitchen bench tops, full private laundry facilities with washing machine, clothes dryer, ironing facilities and a private generous furnished balcony with views. All towels and linen are included.